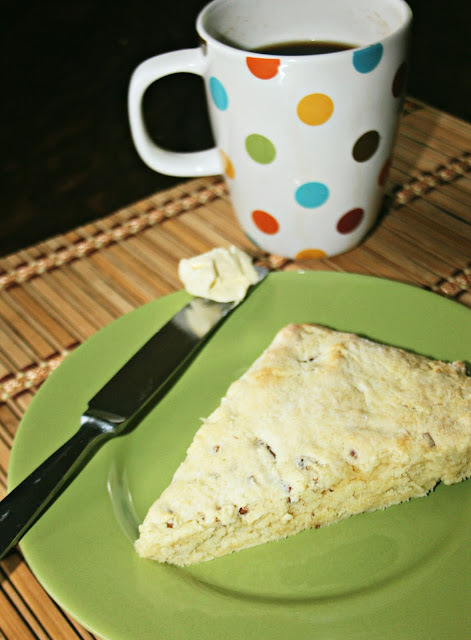 I have blogged before about how much my boys enjoy scones. They eat them for breakfast, but also enjoy having them as a snack. I'm always trying to create new versions of scones for them, so they won't get bored. 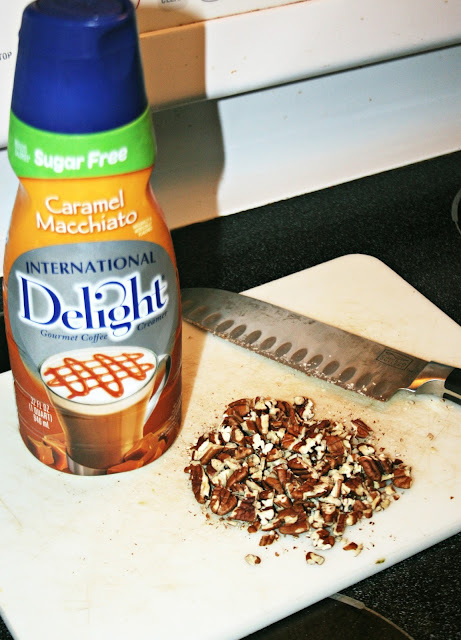 In trying to come up with a new scone, I realized that International Delight's Caramel Macchiato creamer has such a decadent flavor it would be an amazing addition to a scone recipe. I decided to try combining the International Delight Caramel Macchiato (Sugar Free) creamer with chopped pecans to create a pralines and cream style scone. It's a bit sweeter and moister than your average scone, and the boys and I loved them. Combine flour, baking powder, salt, and sugar in a large bowl. Cut in butter using a pastry blender (or knife and fork) until mixture is crumbly and resembles cornmeal. Combine egg, International Delight creamer, and vanilla. Add to flour mixture, adding just enough to moisten the mixture (you may have some leftover). Stir in pecans. Place on floured cutting board (if mixture has become to wet to work, add more flour) and pat into a round disk about 1/2 inch thick. Cut into 10-12 wedges. Place on cookie sheet and bake at 400* for 15 minutes or until light brown. Serve warm with butter and jam if desired. Readers, instead of commenting on this post, I'd love for you to go check out What's Your ID? International Delight is looking for their most passionate flavor fans. Put your ID on the map to enter to win a Magical Trip, play games and discover more unexpected delight. Share your ID flavor at http://whatsyourid.com/.